I'm always on the lookout for aviation news that falls just a hair this side of weird, and this story certainly hits that mark. 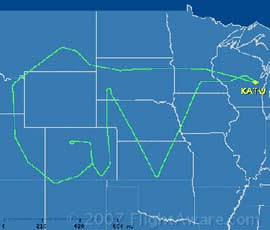 Astute aircraft watchers using flight tracking software, FlightAware, watched the Savannah, Georgia-based business jet manufacturer Gulfstream spelling out an aircraft name, GV, at 40,000ft and 487kt airspeed across the upper Midwest portions of the USA on February 6th. The cursive took more than 8h to complete. Far from being an environmentally insensitive publicity stunt, Gulfstream says the flight had a valid purpose – to “cold soak” the newly built large cabin jet. It was likely the aircraft was a G500, an aircraft previously known as the GV. Test pilots take newly finished aircraft from Gulfstream’s Appleton, Wisconsin, completion facility, up for large chunks of time to make sure everything fits properly at high altitudes and low temperatures. The “GV” route, apparently, is used on a regular basis for those proving runs. Now being in the aviation advertising business, I'll admit to being a forward thinker, but this is damn cleaver. Someone at Gulfstream's flight department had to sit down and plan this out, file as planned, and then fly it with precision. Publicity stunt? Maybe, but at least they didn't have to shut down Boston to unplug a bunch of little digital men flipping you off. Now if the GV was trailing a nice fat line of airshow smoke oil, the folks down there in West Cornrow, Nebraska could have looked up from their combine and enjoyed a taste of what might be some sort of world record for skywriting. Remember that...skywriting? It's when a couple of Piper Cubs blowing Linseed (or various other types) Oil out their exhaust, working in tandem, would spell out 'BURMA SHAVE” over an America that regrettably now seems so far back in our history. The GV flight path did happen. 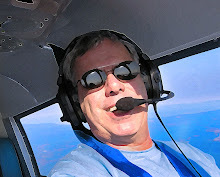 So keep Flightaware bookmarked for those days when you need to know the exact routing for every 737 currently flying, or may be curious about how many King Airs are in bound to your field. It is an amazing site, and I've never even delved into their pay service, which at the very most is $39.95 a month. For that, I suppose you could do a search and find out what flavor of stale pretzels a specific airline and flight number is serving tonight.